Let's pretend that for the past 9 months that I have been totally on top of things and posting regularly as is always my intention. Don't know about you but my mother always said the road to h*ll was paved with good intentions. I do have the best of intentions. The truth of it is, you can't sit in this chair and sew at the same time. If I could, oh the things I could show you! And the past many months has seen a LOT of sewing done. 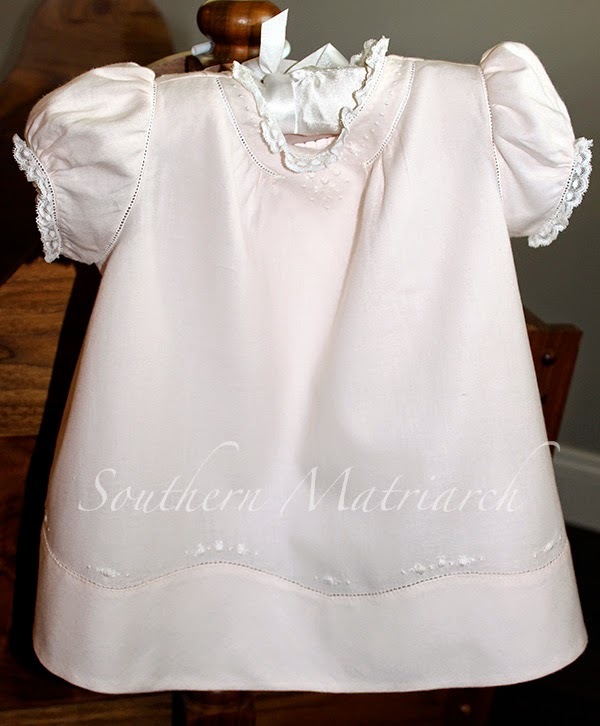 For my son't wedding alone I already shared it was eight weeks of straight sewing. Since the first of the year it seems to be pretty much the same thing. That is okay. 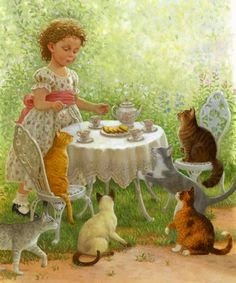 It is what this Mimi does. If the last several months have seen lots of sewing, the past few days have seen lots of file transfer. When you take as many photos of the most beautiful grandchildren as I do and almost as many of different sewing projects, you end up with an astronomical amount of photos clogging your disc space. Astronomical as in thousands. Suffice it to say, my desktop mac was unable to do anything because I had no room. Another frustration that had me spending less and less time in this chair. For several days now I have been transferring files to free up some disc space. It will take several more days to finish this task. I wasn't kidding when I said thousands. After that is completed perhaps it won't take as long to accomplish something if my computer can run at a more optimum speed. 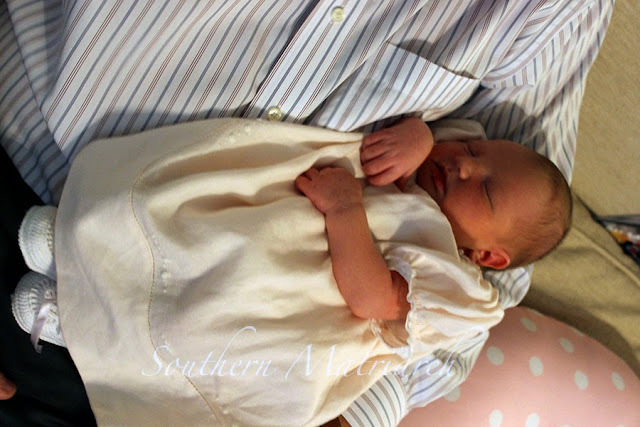 I have been able to edit some photos, albeit poorly of baby Leighton's coming home dress. My daughter wanted to replicate the dress that she wore to come home from the hospital. This dress was completely done by hand from Swiss batiste. 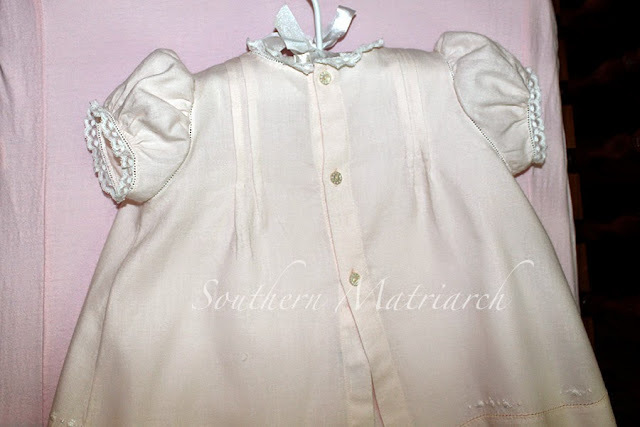 The embroidery is very "rough" but I loved it and loved my baby wearing it. 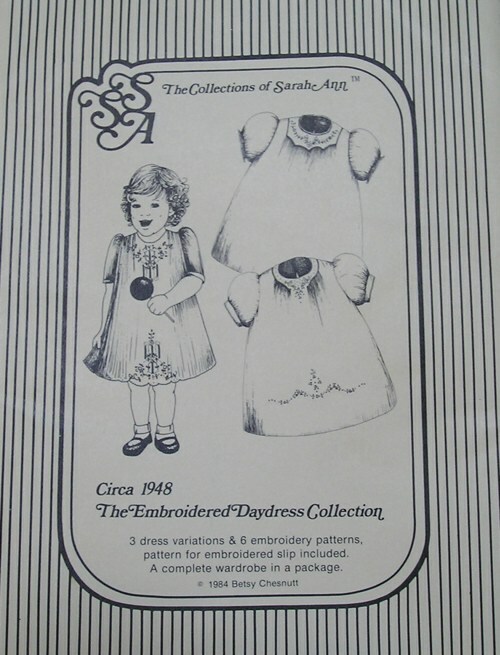 The original was made from this pattern. This is the only pattern by this designer that I have ever seen. There were lots of things I liked about the original and some things I wasn't as crazy about. I wanted deeper pleats on the back and I was never a fan of the sleeve shape. So I decided I would combine parts from a pattern I love the fit, the back and the sleeve shape. 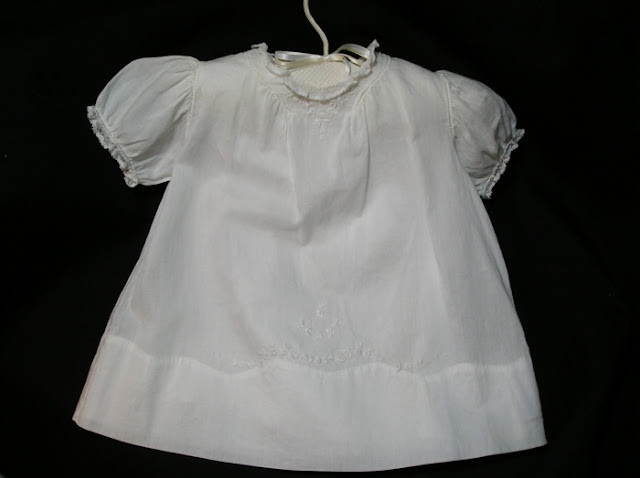 Old Fashioned Baby's "Emma's Smocked Dress". It has recently gone out of print, so be searching your favorite shops now to find what they still have in stock or resort to eBay or Etsy. It is a great pattern. This is the back I love, buttons all the way down the back and has antique mother of pearl buttons. Also purchased from The Old Fashioned Baby. And you can see that sweet sleeve shape. Also this shows the contrast in color. Pink Swiss flannel is a soft muted pink as seen against a pink cradle sheet here. I also did the Madeira hem a little differently than the original. The original has you turn the hem towards the front and stitch. Swiss flannel does have a noticeable right and wrong side to the fabric. 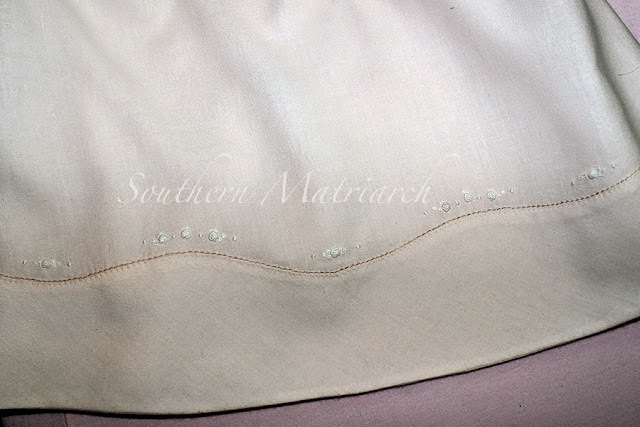 So to achieve the same look, I added a hem band and stitched it in place with a pin stitch. The hem is also accented with bullion roses all around. Also by adding the hem band that was cut on the bias, it eliminated the little tucks at the hem from trying to ease in the fullness on an a-line skirt. on our littlest Princess. Doing what she likes best, to be held. As I catch up on posts, she is going to grow up fast right before your eyes. She is six months old now. 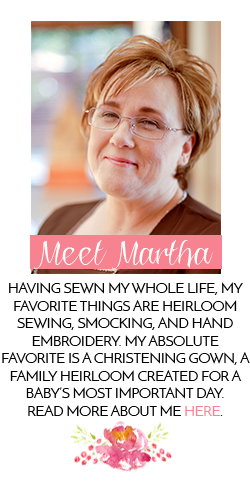 FYI- a friend has a new blog. Berry Hill Heirlooms. Jump over and visit. Tell her I sent you. Good to see you blogging again !! Welcome back! 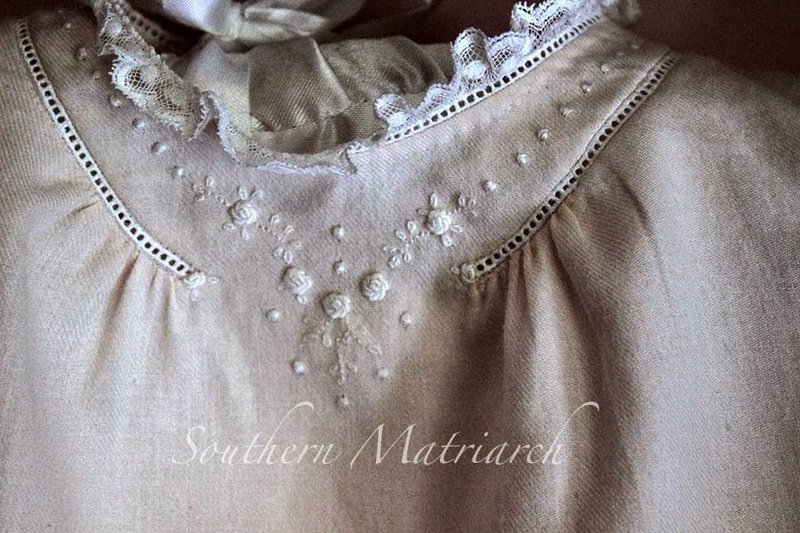 This is such a beautiful dress, and the Bullion rose at the end of the entredeux is really smart. Did you do the pin stitch by hand? How was it on the Swiss flannel? Thanks, the Swiss flannel is quite easy to pin stitch. I did the cheater on my machine with wash away thread, then came back and did the final by hand over that. It is quite a soft fabric but it does have a twill type weave to it. So glad to see you back! The spring season is crazy for my family and I find it difficult to blog much. Thanks! Spring is always busy when you have school aged children. 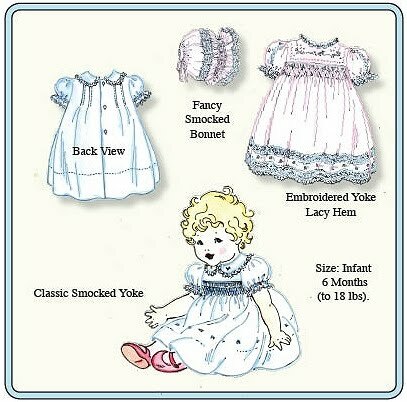 I just ran across your page while looking for lily of the valley heirloom lace. What a beautiful christening gown. The padded satin embroidery, eyelets, and shadowwork are just lovely. What a lucky baby and daughter! This coming home outfit is precious too. Gorgeous madeira and bouillons!!! My daughter would love that dress, not sure if I have to skills to do it yet but worth a try.